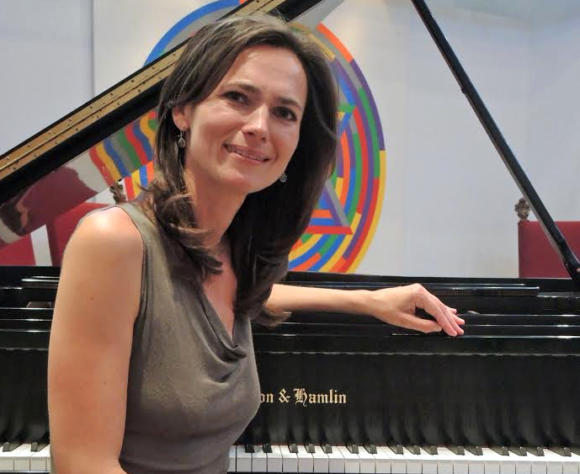 Internationally renowned pianist Dalia Lazar, who will give a concert at the Chester synagogue April 30. CHESTER — Though the internationally renowned pianist Dalia Lazar now lives in Italy, she is always eager to perform thousands of miles away, in the town of Chester, Conn. “I love playing at the synagogue, as it so inspires me,” she says. And so she will play here for the third time in the nine-year history of Music & More at Congregation Beth Shalom Rodfe Zedek. Lazar does more than talk about Chester and nearby local towns – she invests in them. The last time she performed, her dress, her shoes, and her jewelry all came from local merchants. When she returns, this spring, she brings with her a long list of accomplishments. She began studying piano at an early age in her native Zabreb, Croatia, when music “made everything come alive,” she says. “Paintings in my grandmother’s room, the trees outside the window, the courtyard’s balconies, suddenly displayed their own life and movement. My mother, noticing the effect that music had on me, took me to concerts, where I insisted we sit in the first row from where I experienced feelings of wonder and happiness that have stayed with me since. Her first piano teacher recognized her uncommon talent and pianistic ability, and at the age of sixteen she was admitted to Moscow’s P.I. Tchaikovsky Conservatory. During her studies in Moscow, Lazar performed throughout Soviet Union. Immediately after her graduation at the Moscow Conservatory, she decided to continue her career in New York and London where she studied with Karl Urlich Schnabel and Maria Curcio. Lazar made her New York debut at Rubenstein Hall, followed by her Carnegie Recital Hall debut. Since then she has performed a broad repertoire as a soloist in concerts and recitals worldwide, including the United States, Russia, Venezuela, Israel, Switzerland, Croatia, Mexico and Romania. Her chamber music repertoire includes the works for violin and piano duo and piano trio, which she performed extensively with her late husband, violinist Lucian Lazar. Her recent CD includes works by Schumann and Chopin. Congregation Beth Shalom Rodfe Zedek is located at 55 East Kings Highway in Chester, CT. For more information or to purchase tickets, visit the cbsrz.org website.